Every time I read a historical novel set during the Second World War or see a film that takes place during the Holocaust, I find myself hoping that the events will take a different turn. I know the way the stories go. I know what happened when the Nazis occupied a country or a town. But the knowing does not stop me hoping. Every time the yellow stars are handed out or the trains roll in, I long for the people to rise up and stand together, Jew and Gentile side by side, refusing to obey the German orders. Just one time, I want to see a massive revolt instead of passive cooperation. Of course, I also want to think that I would be that person who would not stand by and let it happen. While we were in Amsterdam, we had the opportunity to stand in some of the places where these events occured. 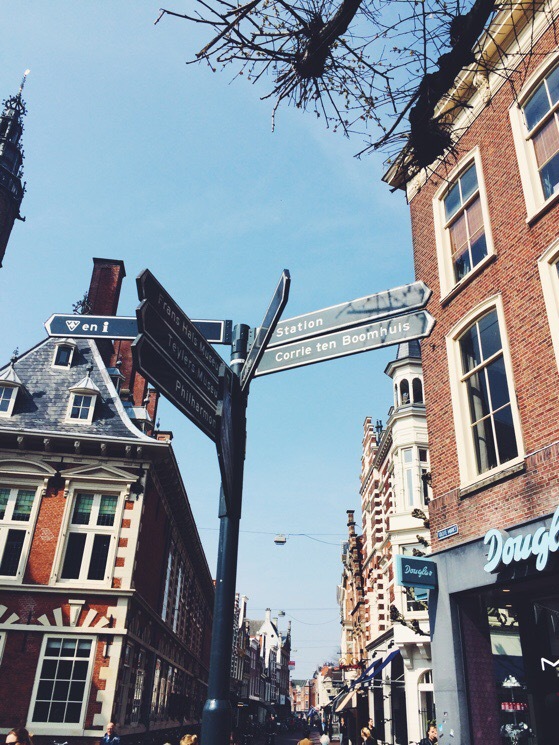 We followed a local through the Jewish history of Amsterdam, and she walked us back in time to long before the war, when Amsterdam’s arms welcomed Portuguese Jews escaping the Inquisition. A community grew up in the city, among the Catholics and Protestants. Amsterdam was a place of religious freedom, she told us. We visited the Portuguese Jewish Synagogue, where for hundreds of years, services have been held by candlelight. It is still a mystery, but this sacred space was untouched during the war, despite massive looting of all Jewish homes and businesses. Though every scrap of wood that could be found was used for fires in the winter of 1944 when the city was at its coldest and most desperate, the carved benches and beams of this synagogue remained intact. A small number of Jews returned to begin to light the candles and worship here again after the war. Their children are the keepers of the ancient books in the library and the tapestries in the museum, all preserved from harm. Small miracles in the details fuel my hope for light within this dark story. We walked past the theatre that was used as a holding place for Jews while they awaited the trains that would take them away. Some remained here for a few hours. Others spent days in the overcrowded hall. Children were held across the street in a building from which many were smuggled out by a man who sent them to live with families in the countryside. 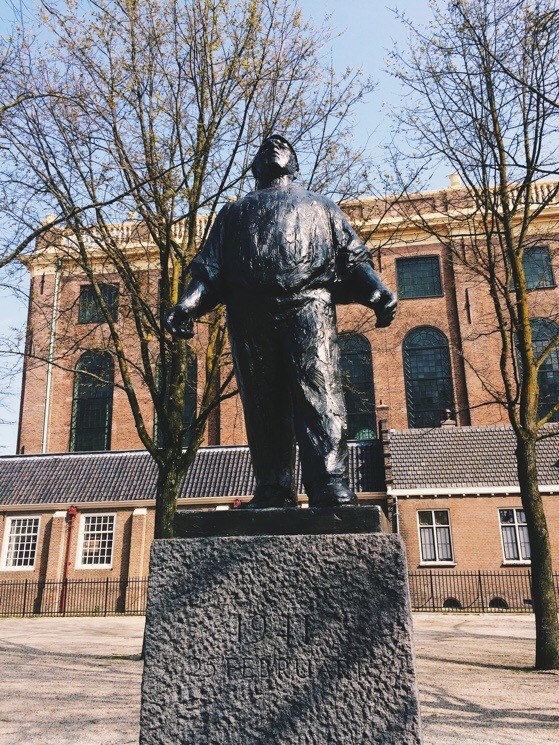 We stopped at a statue of a dock worker, marking a strike of Dutch workers that took place when the first Jewish men were arrested and taken away in Amsterdam. The strike was immediately squashed by the Nazis and its leaders executed. Only one of the 427 Jewish men from that first arrest survived the camps. I remained fascinated by this story because strikes and protests against the Nazis seem to be rare instances in the WWII narrative. More commonly the resistance took place behind closed doors. Claire, our guide, tells us that when she was house hunting in Amsterdam, she discovered that many homes still have a secret annex or hidden rooms from the war. Over 25,000 Jews were hidden in Holland during the war but around half of those were discovered and sent to camps. We stood in line to see where Anne Frank and her family were hiding before someone betrayed them. We walked through the rooms where Anne and her family spoke in whispers for over two years. We saw the little desk where Anne scribbled her story onto pages, hoping that one day someone would read it. But there is something about being present that is so different from reading about it. All those stories I have read and films I have watched do not have the same weight as seeing my own son crawl into the hiding place for the Jews that the Ten Booms built in their Dutch home. We rode bikes to the neighboring town of Harrlam to see the closet at the end of Corrie Ten Boom’s bedroom, built with bricks that were smuggled into the house inside grandfather clocks. We sat in a circle in chairs where the Ten Booms lived and breathed and carried out their part in the resistance until they were betrayed and arrested. I’ve heard Corrie’s story all my life and watched The Hiding Place as a young girl, but being there in her house made me ask different questions. Would I have put my family at risk by hiding others? Would I have faced arrest? Would I have been like Corrie’s father when they came for me? He chose death in prison over remaining quiet at home. Father ten Boom’s bravery makes me cry happy tears in spite of learning over the last few days that the Dutch Jewry were practically annihilated during the Holocaust. The percentage of Jewish people who lost their lives in Holland was higher than in any other nation. Claire pointed out on the street a small gold square, ten centimeters on each side. A stolperstein. Or a stumbling stone. These are all over the world now, she told us. An artist in Germany, Gunter Demnig, was speaking to someone once who claimed that no victims of the Holocaust had lived in her neighborhood. This discovery led Demnig to create small memorials to victims of the Holocaust that would be placed on the street in front of the last known residence of the victim. This phrase is followed by a name and birth year. Then a deportation date. A death camp. You are meant to stumble over them. And then to note that someone once lived here, a person for whom life took a turn down a very dark road. Now that Claire had pointed them out to me, I kept my eyes open for them. There were more stolpersteine on our walk into Amsterdam. There are just over 40000 of these stones in the world at present. A vast number considering the project is less than ten years old. But it’s a small number when you think that there are over six million Jews to be represented. As well as many non-Jewish victims of the Holocaust. 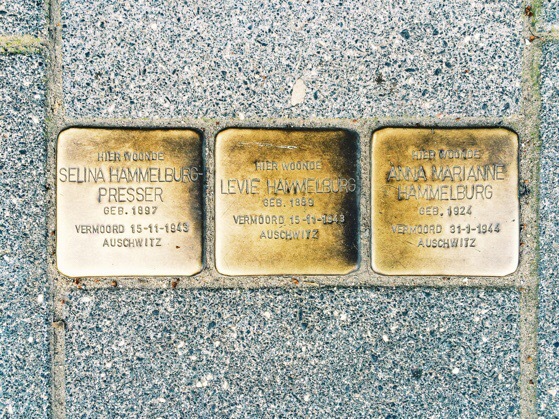 And if one day there are millions of stolpersteine on the sidewalks of Europe, will everyone be remembered? And what about the victims of homicides that have occurred since? Is there a world in which no victim of injustice will be forgotten? When we came back from Amsterdam, we watched The Hiding Place together. Again, we watched the story go the way it always does. The trains carry the people away to their deaths. It may seem a small comfort in the midst of so much suffering. When I see a stolperstein I wonder who they were. I wonder about their story. And I am in awe of the one who knows all the stories. God has seen every tear, heard every cry, felt every injustice. He knows every name, whether they be written on the streets or not. A great big thank you to Context Travel for sending our family on a tour of Jewish history in Amsterdam! We’re grateful to Claire for her patience with our kiddos and her extensive knowledge of the city. This was our second Context Travel Tour and we love getting to learn those special details about a place that only a local can share. We visited the Anne Frank House and the Corrie Ten Boom House separately from our tour. Both are well worth the time and effort to see. Love this post. Made me cry, but also gave me hope. This may be your most beautiful blog post yet. Thank you for sharing this experience with us in this way. Aww! That’s super sweet, Deserae! Thanks so much. Super encouraging. We were talking about you last night at a PV reception–next yr PV will no longer be elementary school…good to see many and please know you have invested (along with FN) much in the lives of many teachers and others there. Such blessing acknowledged and with such thankfulness!